Ooooh I wonder if I recognise the pawn structure. I think I prefer White. His kingside pawn majority is going to become mobile after h3 (possibly preceded by g3 to stop ... h4 - though I'm not sure this is necessary) and g4. This will give the bishop more scope and it'll be able to act offensively and defensively, likely on the a1 - h8 diagonal. 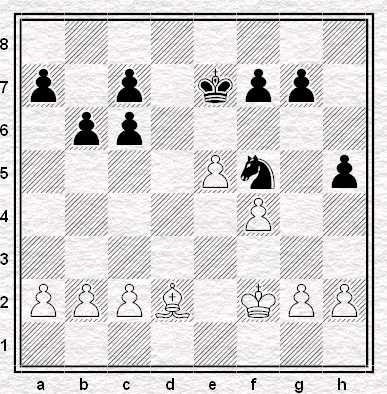 Probably I'd place my queenside pawns on a2, b3 and c4. and plonk either a knight or a king on d5 and await developments. This may mean having first to defend, or sacrifice, the pawn on c7. Wait a minute. This is a trick question. The correct answer is: 'Neither, since the Berlin is boring.' Right!? An excellent point - and if it's the Berlin, surely we're still in book ? I prefer white due to the bishop and kingside pawn majority. I wonder how important the 'black to play' part of the question is. 1...g5!? This game is indeed from a Berlin Defence as my eagle eyed fellow bloggers have noted. "... Black has already made good progress wiht his king and if anything it is White who already needs to be careful. In the game it turns out that teh decisive factor is the dominating black king on d5 [well done Seani], which is possible precisely because White doesn't have his pawn on c4." "White doesn't appreciate the danger. He ought to have taken control of d5 with 26. c4 [well done Angus]...."
So Black did go on to win the game but not necessarily because his position is particularly better at the point we joined in.